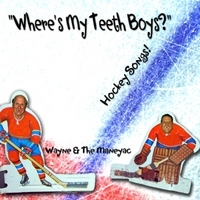 The first ever album of funny hockey songs! Includes the soon-to-be classic anthem "Hey Goaltender," to be played in arenas when there's one minute to go and the home team is clinging to a one goal lead! A must for every hockey player and fan. 1. Where's My Teeth Boys? 6. Honey Does My Gear All Stink? Wayne Faust has been a music and comedy performer for over thirty years, recording 15 albums of funny songs, including "Save the Beer" and "Bald Guys Are Cool." (www.waynefaust.com). He teamed up with his friend and sometime goalie Dave Maney to make the first ever album devoted strictly to hockey. There are lots of funny songs here, along with a tribute to Dawg Nation, an excellent charitable organization based in Colorado that raises money for injured or ill rec league players, and a soon-to-be classic anthem called "Hey Goaltender" for fans in arenas where the home team is up by one goal with a minute or two to go. This is well-recorded stuff, with lots of different musical styles, including the title song, "Where's My Teeth Boys?" which would fit right in on a bluegrass album. There's a funny new version of "O Canada," written by Canadians for Americans. There are three live recordings from a hockey banquet in Colorado. There's even a hilarious parody of the opera classic "Tarantella" about a Zamboni driver. Every hockey fan and player is going to want a copy of this one!